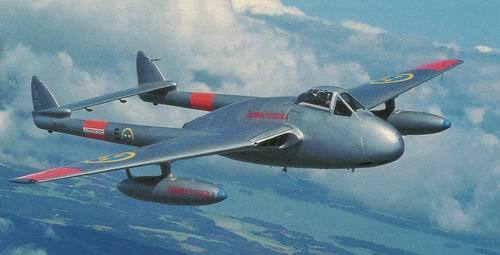 After 80 hours on the SAAB 91 the Air Force sent me on to the De Havilland Vampire jet trainer. We got some 5-7 hours in the two-seater and were then sent on to fly the single seater fighter version. http://www.vampirepreservation.org.uk/ Link courtesy of Captain Tom Ehnert. This picture is showing an A32 on display at the Air Force museum. My two SAABs. The one in the foreground is a brand new SAAB 96 that I bought in the spring of 1964. In the background an A32 Lansen landing at RW31 at F15 in Söderhamn. While based in Söderhamn, I also checked out on the J3 Cub on skies at Mohed Flying Club. 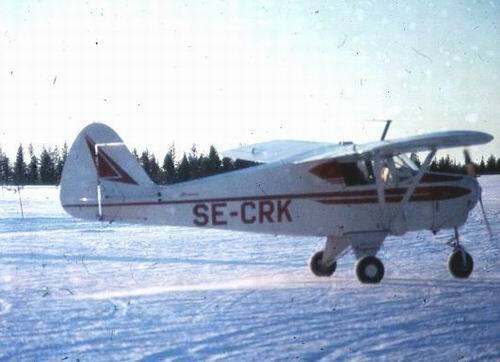 The picture is showing a similar aircraft at the Ljungbyhed Flying Club. In 1964 I was transferred to the Air Force Academy at F20 in Uppsala, just north of Stockholm. 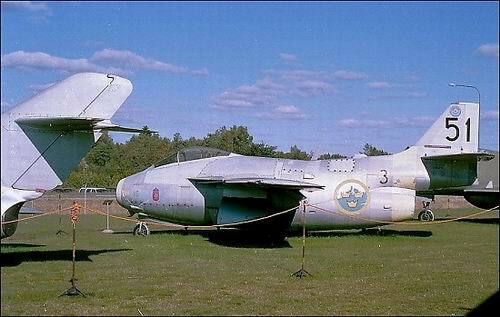 The flight duty there was done on the SAAB J29F. 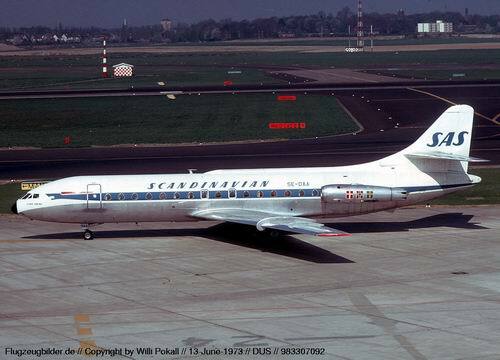 At the end of 1964 I left the Air Force and joined Scandinavian Airlines, but was offered an opportunity to do Air Force duty at F3 in Linköping where I flew the J29F and the S29C whenever I could get time off from SAS..
My first aircraft in SAS was the Sud Aviation SE210 Caravelle. 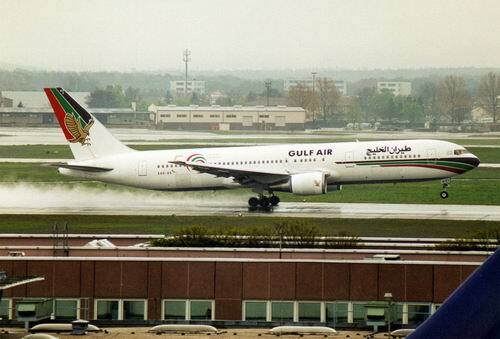 We operated all over Europe and occasionally also to the Middle East. SAS Flight Academy had a SE-210 systems procedure trainer and I was pleasantly surprised when I saw this old box at the Technical Museum in Stockholm last year. In June, 1957, SAS became the first airline outside France to order the Sud Aviation Caravelle. Six aircraft were ordered. 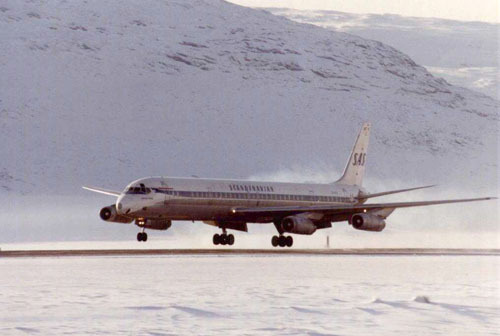 Caravelle introduced the jet age in SAS on April 26, 1959. 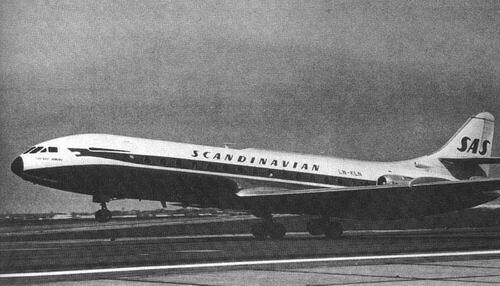 Eventually, SAS had 21 Caravelle aircraft in its fleet, and the popular aircraft served SAS honorably for more than 10 years. In 1967 I transferred to the DC-8. SAS operated -33, -55F, -62 and -63 versions. They became the standard long-haul aircraft and we flew it to Greenland, Asia, United States and Canada, Africa and South America. 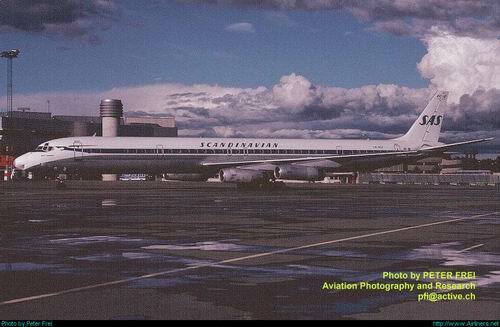 SAS was the largest DC-9 operator in the world outside the US. We had -21, -33F and -41. Later SAS got a lot of MD-80s as well. I was assigned to the DC-9 as a co-pilot in 1971-1974 and later in 1980-1987 I flew DC-9/MD-80 from the left seat.. The most interesting and challenging duty was winter operations in Northern Norway. Snow, icing, slippery runways and a lot of wind made it very interesting. 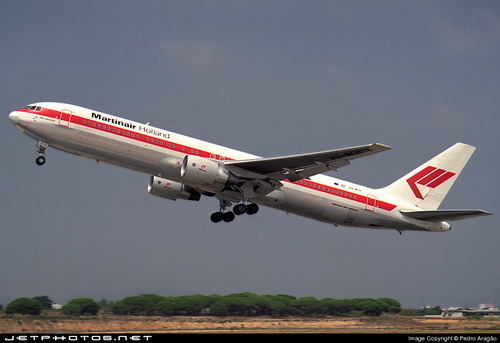 In 1978 I flew the DC-10-30 for less than 10 months. Most of this time I was based in Tokyo to fly Tokyo-Anchorage once a week. 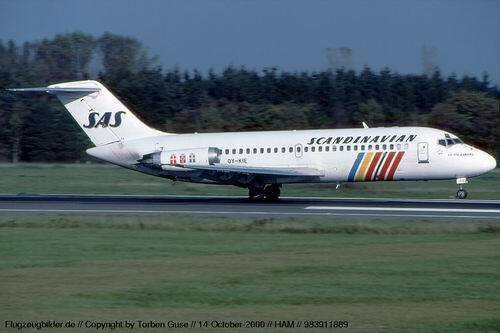 I enjoyed flying the DC-10, but SAS had just bought Transair Sweden and needed some SAS pilots to fly the B-727 there. I applied and was given a chance to get an early command and got sent home from Tokyo. I had the pleasure to do my ground school on the 727 with Sabena in Brussels and the simulator with TAP in Lisbon. My simulator instructor was Captain Hans Hanes, who trained me and my copilot, René Modigh from Linjeflyg. My base training and check was done by Tranair's Chief Pilot Tage Sundman. We then operated summer charter turnarounds to Mediterranean destinations and in the winter we flew to the Canary Islands. 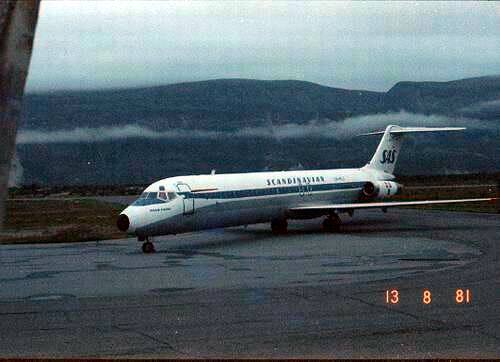 We also operated for SAS to Narssarsuaq in Greenland via Keflavik in Iceland. We had FUN! I also took the time to get a seaplane rating. 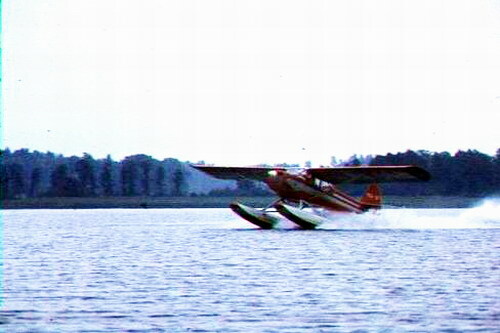 The aircraft I trained on was an Auster Mark IV and this picture is from Mälaren, the large lake just west of Stockholm. 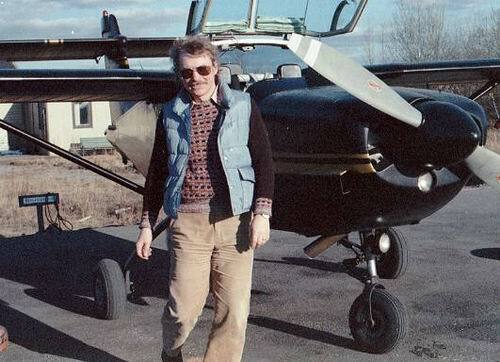 My instructor and also aircraft owner was Captain Lennart Scherdin in SAS. Picture by Helmuth von Hirsch, Senior Dispatcher with SAS. 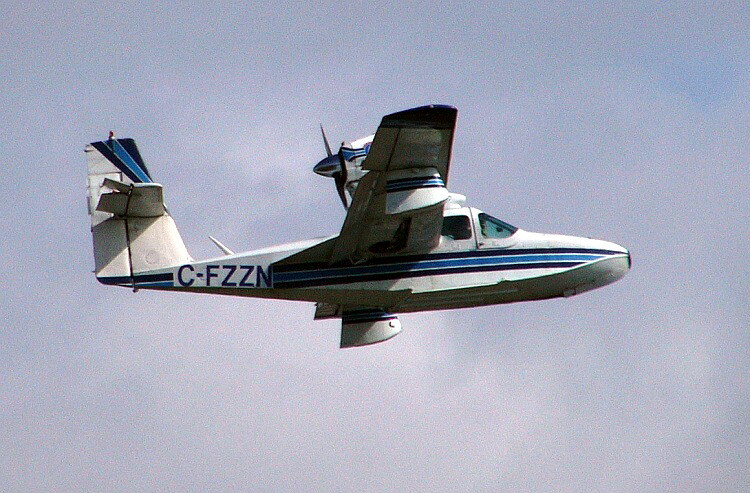 I later got a rating on the Lake Buccaneer, an amphibian, similar to the aircraft in the photo, but did not fly it much. I never felt comfortable with the pitch handling qualities of this aircraft. I sometimes rented this Piper Arrow and flew to a small air strip, Myran Airport, in my home town, Härnösand in northern Sweden. 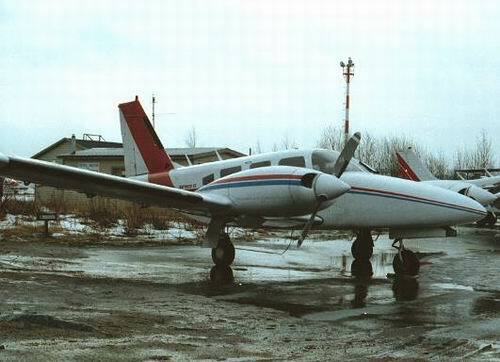 When I flew the left seat on the DC-9 in 1981, I had too much time on my hands and started to instruct instrument and multi-engine on this Piper Aztec Turbo at Flygcentrum AB at Bromma Airport, close to downtown Stockholm. My lead instructor and boss was the legendary Härje Westrin, also known as Africa-Härje, after his many years with ICAO in Africa. Captain Westrin was later instrumental in getting me a pilot slot on the DC-3 operated by Flygande Veteraner in Stockholm. Unfortunately the school was grossly mismanaged and the owner, Curt Hanson, was forced into bankruptcy. Flygcentrum AB has later been resurrected and is now on the approved list of aircraft operators in Sweden. Captain Westrin took me with him to join Aerorent AB at Bromma Airport in Stockholm, where we used a couple of Piper Senecas, PA-34, for instrument and twin training. This particular aircraft is SE-GIP and I once did a landing on the grass north of RW26 at Arlanda Airport when my student and I could not get the right main gear to lock down. Damages from the landing were minimal, but the recovery operation caused some wing skin damage. This young man (me !) borrowed this SAAB Safari at Aerorent AB as often as he could and practiced in order to get an aerobatic instructor rating. 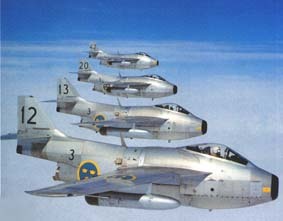 When SAAB built the SF-340, they contracted SAS to do customer training. I was given the job as Assistant Chief Flight Instructor at the SAS SF-340 Training Center and spent a lot of time at SAAB and had the opportunity to fly the prototype during the flight test and certification period. I also learned a lot about training planning and curriculum building from the Chief Flight Instructor, Captain Sten Appelgren. When the deliveries started we trained all non-US customers in the simulator, which was then located at Bromma Airport in Stockholm and then we usually went out with the customer to do base training and to fly with them during initial line operations. 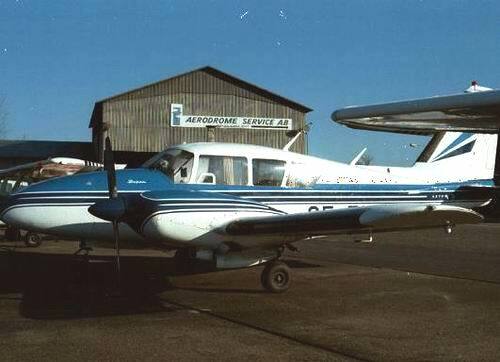 The picture here is showing an aircraft that was sold to Birmingham Executive in Birmingham UK. I spent a couple of weeks with them, mostly waiting for Birmingham Airport to come out from under the snow cover. 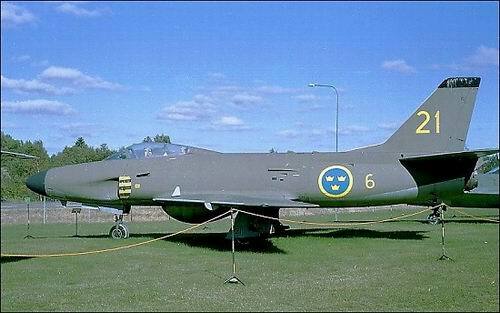 SAAB later had to repossess this aircraft, when the airline fell behind on payments. We did a lot of engine-out work during the certification and that was real engine-out work, not simulated. The Australian Authorities wanted the Kendell Air pilots to have some line operation before the aircraft was ferried to Australia and I took the aircraft and pilots to Kramfors Airport in Northern Sweden in the middle of winter. The aircraft here is SAAB 340A VH-EKD S/N 155. In early 1985 I then had the pleasure to spend a couple of weeks with them in Australia, flying with them on their initial line operations. I flew out of Melbourne to places like Cooma, Merimbula, Albury, King Island and Wagga Wagga. 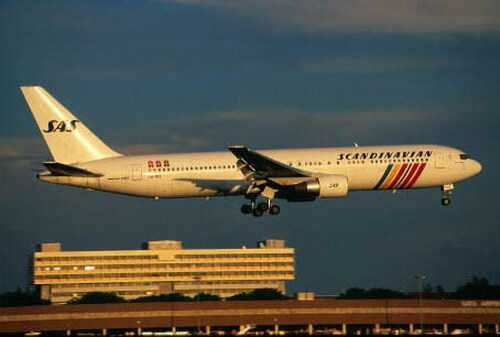 After many years with SAAB, I got the job as Chief Flight Instructor on the B767 introduction project in SAS. After training in Seattle, Captain Ib Schmock, Fleet Manager, Captain Karl Steinland, Assistant Chief Flight Instructor, and I did our initial line operation with Gulf Air in Bahrain. Here you can see one of our instructors, Captain Sammy Maidan with Captain Ib Schmock (on the right) and me. We flew all around the Gulf area, into India and on our final release flight, to London Heatrow. The initial flights with the B-767 in SAS were to Newark Airport outside New York, but we also used it on the London Heatrow route for training. We had a lot of training going on and I was spending a lot of time giving type rating checks in Seattle before we got our own simulator in Stockholm. I finally decided that working under someone who did not understand anything about simulators and training was not worth wasting quality of life for and I quit working at the Flight Academy. And no, I am NOT referring to Captain Otto Lagarhuus, but rather one of his minions. 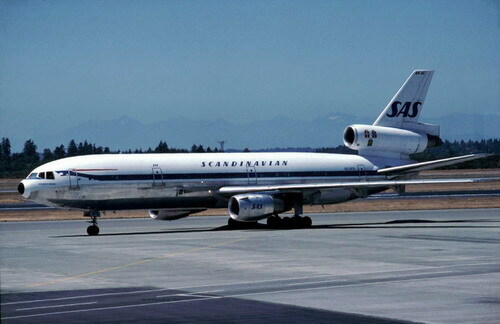 I was immediately assigned to the SAS Flight Test Office and again spent a lot of time with Boeing in Seattle, this time accepting 767s for SAS and for Martin Air of Holland. SAS assisted Martinair with their introduction of the 767. We did some of the training in Stockholm and I also gave IOE to some of their Captains. When I was doing acceptance flights on their 767s in Seattle, the reverser restrictions that followed the Lauda accident were put in place and we had some really interesting moments during the test flights. Photo courtesy of Pedro Aragao. While I was flying the B-767 for SAS I also had the great pleasure to fly the DC-3, Daisy, at air shows and promotion flights. Great fun and it was a huge contrast to flying a modern glass airplane. In 1991 SAS, as usual, was out of sync with pilot demand and supply and we were encouraged to take leave of absence and go on projects with other airlines. I was on a project group that negotiated with ANA and that led to a number of Captains serving in Japan for a while. 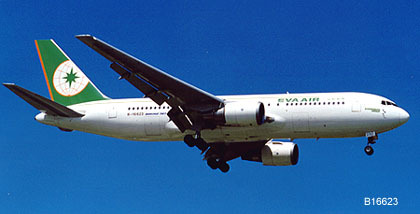 I ended up with a three-year contract with Eva Air in Taiwan and started training with them in December 1991. 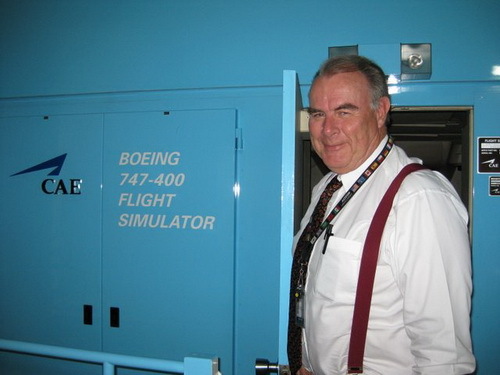 We used the ANA simulator in Tokyo and my instructor was Captain George M. Fay, formerly with Frontier, UPS and UA and the best pilot and instructor I have ever seen. After six months of flying the B-767 in Eva Air, I was told that I had been selected to go on the first B747-400 course and that I was going to be what they called "Training Supervisor B744". The course started in Seattle in September 1992 and a group of us then continued with Boeing instructor training and after that we gave simulator courses in Seattle and at NATCO in Minneapolis. I returned to Taipei just before Christmas 1992 and then went on to fly the 744 until retirement in 2005. I was dual qualified B744/B767 for a couple of years, but gave that up when scheduling requirements made it difficult to get days off and at the same time staying current on two types. After mandatory retirement in 2005, Eva Air offered me a job as B777 simulator instructor in their training center in Taoyuen, Taiwan. 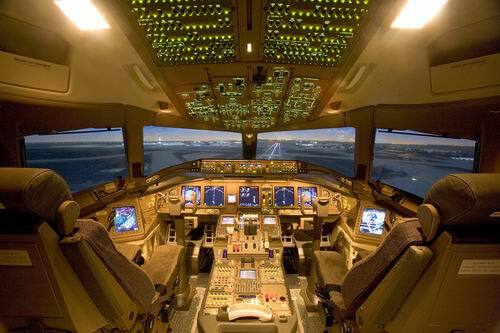 This picture is the official Boeing B777 cockpit picture and is also showing the Electronic Flight Libraries installed outboard of the pilots' seats. This is a free standing computer system with applications for Jepp charts, performance, GPS airport moving maps and other stuff like airline manual libraries and report writing. 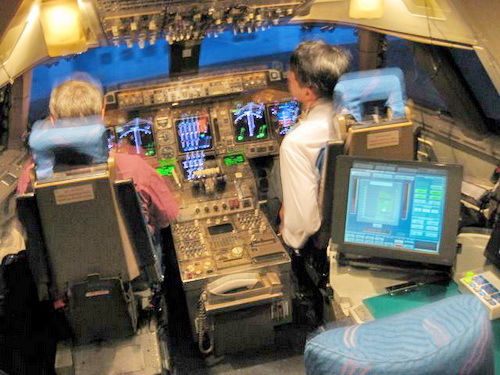 In March 2008 Alteon/Boeing assigned me to their training contract in Korea where I am now training KAL 747-400 pilots. 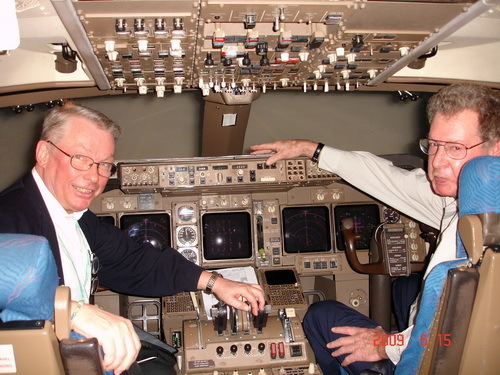 In this picture I am training another ex-Eva Air pilot, Gunnar Jensen, who is also working as a simulator instructor at the KAL training center. 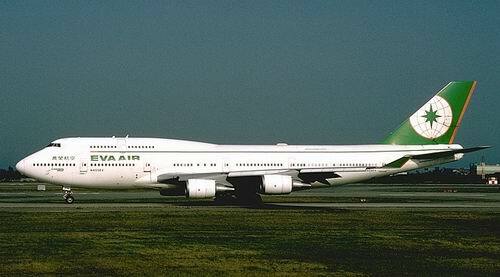 This is "Big Dave" Morehouse, another ex-Eva Air 747-400 Captain. Dave was my student in Minneapolis in 1992 when he was first hired by Eva Air and he is now working as an instructor and checker at the KAL training center in Korea under the Alteon/Boeing contract. All instructors have to take regular simulator checks, just like active pilots. Here Mike Enright and I are shown during our Proficiency Training on June 15, 2009. Mike and I know each other from our time in Eva Air.